The Sävor River, northern Sweden, under late winter conditions. The frozen river has been sensed by ADCP and seismometers to constrain flow properties and bedload transport dynamics (credit: Michael Dietze). 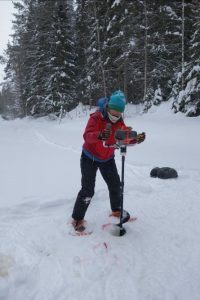 Why Swedish, Finnish and German geomorphologists meet in the boreal zone to drill holes into icy rivers and frozen ground. There are many ways to counter the lazy days between Christmas and the EGU meeting. One of the more promising ones is this: think of doing collaborative field work in February, in northern Sweden, on and around a frozen river. This is what Lina Polvi, Lovisa Lind (both Umeå University), Eliisa Lotsari (University of Eastern Finland), Jens Turowski and Michael Dietze (both GFZ Germany) decided to do. 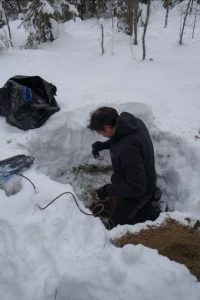 They met in Umeå, northern Sweden, at 64° North – just when the thermometer had recovered from its chilling excursion down to -25° C back to a cozy -12° C – to investigate how much and how fast water flows under an ice-covered high-latitude stream, and by which mechanism and how much sand and gravel are transported in these northern rivers during the cold period of the year. Lina drilling a hole through half a meter of river ice to sense the stream properties (credit: Eliisa Lotsari). We all know that bedload transport is a key process in rivers, affecting nutrient transport, habitat availability and hazard potential of streams. Yet, currently, in northern regions, scientists are virtually blind-folded for almost half a year when thick ice cover precludes the view to the hydrodynamic processes in channels, and traditional survey and monitoring methods are unavailable. So, how do you measure flow velocity and bedload transport when your research object is hidden below half a meter of compact ice? Well, at least the hydraulics are quite easy: flow velocity can be measured with an acoustic doppler current profiler (ADCP), a device that can measure bed topography and flow velocity in three dimensions in the entire water column. In the summer the ADCP can be towed across the stream on a small raft, but in winter in a frozen river, it needs to be lowered into holes drilled through the ice. And even in the 21st century, a few days before women’s day, the staff at the fishing shop that rented out the motorized ice auger felt the need to carefully and skeptically explain to the women that an ice auger is a “very powerful and dangerous thing”. The three female scientists politely expressed their gratefulness for the concern, pointed out their prior experience, and hired the machine anyway. Letting the sensors doing their work. Lovisa, Jens and Lina observing an ADPC measuring hydraulic conditions under ice (credit: Eliisa Lotsari). Packed with the auger, ADCP, geophones and seismometers, a scary ice saw, red spray paint, a GoPro camera, time-lapse cameras, and plenty of duct tape, all five river scientists trudged through the meter deep snow with snowshoes along the bank of the Sävar River until they found a reach with ice thick enough to walk on. How do you recognize that it is thick enough? Well, you may be less careful, but our heroes used a well-known and long-established Swedish testing device with a mass of 400 kg: the moose. Seeing moose tracks in the snow on top of the river ice is always a good sign that it is safe to walk on. Before the first measurement could be made, around 20 holes with a diameter of 20 cm needed to be drilled through 50 to 80 cm thick ice. This was shared fun and with the last ice layer collapse, as the dark brown river water seeped up to the surface, the site was ready for the ADCP surveys, water sampling and underwater videos with the GoPro camera. Letting the sensors doing their work. 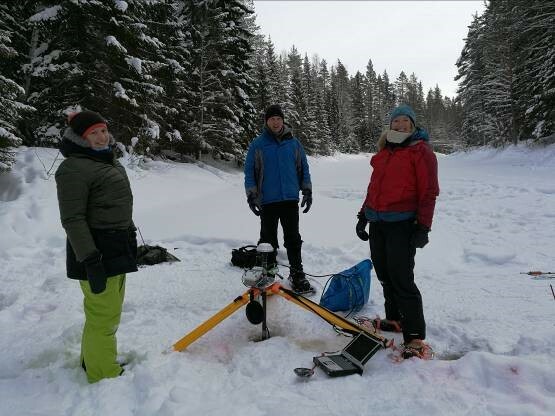 Lovisa, Jens and Lina observing an ADPC measuring hydraulic conditions under ice (credit: Eliisa Lotsari).scary ice saw, red spray paint, a GoPro camera, time-lapse cameras, and plenty of duct tape, all five river scientists trudged through the meter deep snow with snowshoes along the bank of the Sävar River until they found a reach with ice thick enough to walk on. How do you recognize that it is thick enough? Well, you may be less careful, but our heroes used a well-known and long-established Swedish testing device with a mass of 400 kg: the moose. Seeing moose tracks in the snow on top of the river ice is always a good sign that it is safe to walk on. Before the first measurement could be made, around 20 holes with a diameter of 20 cm needed to be drilled through 50 to 80 cm thick ice. This was shared fun and with the last ice layer collapse, as the dark brown river water seeped up to the surface, the site was ready for the ADCP surveys, water sampling and underwater videos with the GoPro camera. Installation of a seismic station to sense hydraulic and sediment transport dynamics of the Sävar River by Micha (credit: Eliisa Lotsari). Meanwhile, Micha left the slippery ground to explore the bank and terrace landforms around the measurement site. He scouted for suitable locations to deploy geophones and seismometers. Geophysical instruments designed for earthquake analysis in a study about fluvial geomorphology? Indeed, seismic sensors are ideal for gathering information about hydraulic dynamics and sediment transport where other systems would simply fail. The instruments are sensitive enough to record the impacts of the smallest rain drops, and they deliver precise estimates of the seismic wave field emitted by the turbulence of the water and pebbles being dragged over the river bed. And crucially, they do not need to placed within the river, but can monitor everything comfortably from the bank. Three geophones were installed along a line perpendicular to the river, and one broadband seismometer some 30 m upstream. The instruments need to be installed in a hole in the ground, half a meter deep. Luckily, the ground was not frozen throughout, as suspected, and the loose sand beneath a surface layer of only 10 cm of frozen soil was easy to remove. The charcoal brought to defrost the ground was put to good use in a barbecue at lunch time. The sensors were leveled in the holes, oriented to North, connected to the data loggers and the station was ready to record 1000 samples per second for the next month, until the batteries need to be exchanged by Lina and Lovisa. The seismic sensor network forms a triangle that allows for not only constraining water flow and sediment transport, but also locating seismic point sources, such as cracking in the ice. This latter functionality will become especially interesting when, in late spring, the frozen surface of the river cracks open and potentially an ice jam forms while a flood rushes through the valley. The combined information on timing and location of single events allows detailed insight to the anatomy of this seasonal singularity. Furthermore, the seismic survey allows inferring the seismic signature of such ice break-up events, along with precursor activity like small cracks that compensate the increasing tension within the ice cover. 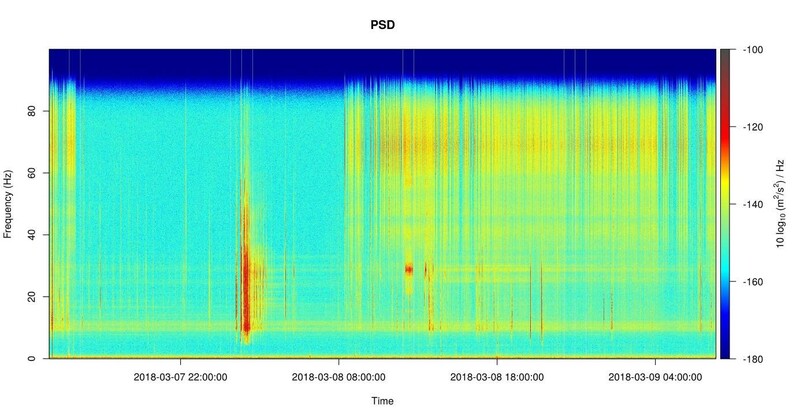 Spectrogram of two days of seismic recording. River turbulence is visible around the 10 Hz band (continuous yellow band), the activity period in early morning of 7 March presumably represents an ice break-up event 100 m downstream the installation, and the high frequency activity is caused by wind, interacting with the trees (credit: Michael Dietze). 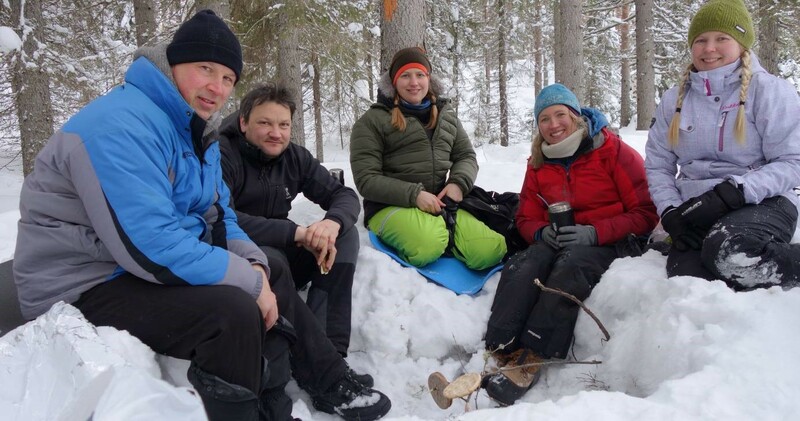 The field team (Jens, Micha, Lovisa, Lina and Eliisa, from left) enjoying a winter barbecue after successful installation (credit: Eliisa Lotsari). After two chilly days in the field most of the work is done, the seismic network is ready to operate, the ADCP data is already processed and the team is improvising to enjoy a winter barbecue, chatting about when to meet again to recover the equipment, bring together the data output and share ideas for the follow-up project.